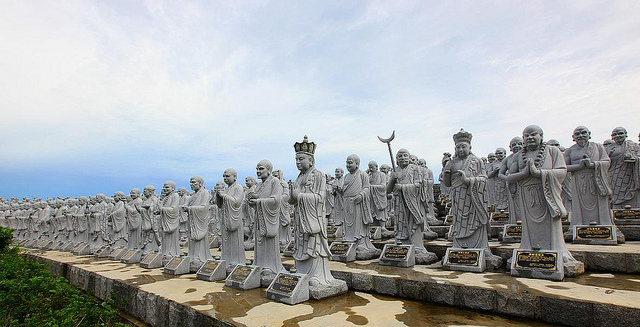 To enter the vihara, visitors must pass through an impressive archway guarded by General Heng and General Ha. 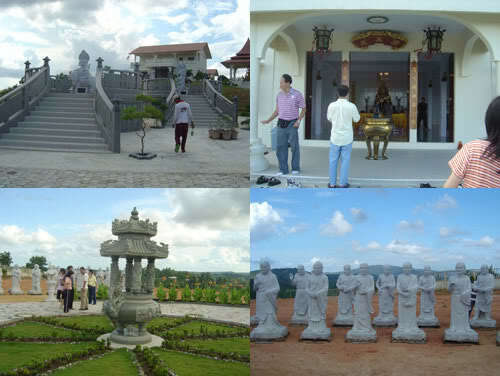 Next to the archway is a pavilion with Buddhas in Thai style and facing this pavilion is a sculpture of baby Buddha. The surrounding wall is decorated with Tibetian Buddhist symbols. The main hall is just next to the pavilion where a sculpture of Ksitigarbha Bodhisattva sits on the altar. Below it and on the floor is a Taoist deity of filial piety. Guarding the main hall are life size sculptures of the Dharma Protectors Weituo and Sangharama Bodhisattva, 伽蓝菩萨, more well known as Guan Gong. From the main hall, a felt of stairs leads visitors to an amazing garden. There, 500 life size sculptures of arahats stand orderly in rows on each of the steps at the edge of the garden. The names of each arahat appear at the base of their sculpture. Each of the 500 sculptures is extremely lifelike capturing the characteristics, facial features and postures of the arahats. There is a sense of orderly formation and movement at the same time. These 500 arahats must be every photographer’s wonderland. The 500 arahats seem to be main attraction in this vihara. In fact, the locals and tourist maps refer to this vihara as the 500 arahat temple complete with photos of the arahats in the local tourist map. The vihara is not very easy to find but a few checks with the locals will eventually lead you to the temple. Maybe a little effort required getting there but it is definitely worth it.